What is the torri in Nagasaki made of? It survived the atomic bomb in 1945 and the earthquake and tsunami in 2011? It is still standing??? -although, Nagasaki is on a bay on the west coast of Kyushu, and the earthquake/tsunami struck the sanriku coastline- the area facing east/northeast around Sendai, about 715 miles from Nagasaki to Sendai- at that distance, I do not think that there was any perceptible movement. 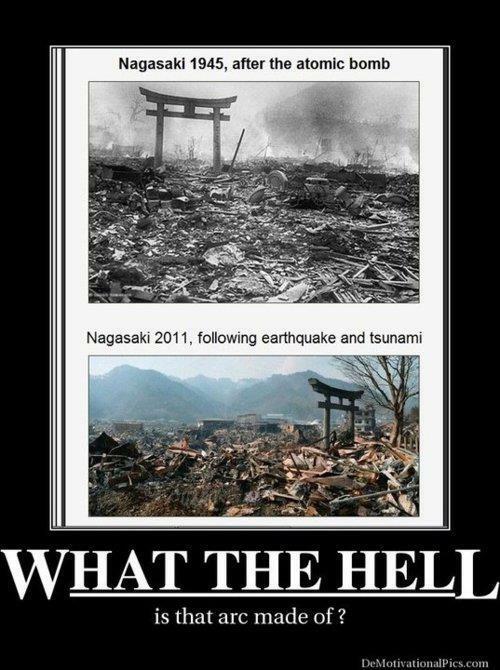 There's a picture circulating that purports to show the torii at Nagasaki and the same torii at Tohoku. They are two different torii, with slightly different design changes. we didn't feel the earthquake at all in Nagasaki, and if there was any rise in water level, it was minimal. We had tsunami sirens going all day and kids came home from school early, but there was no damage in Nagasaki.